The 3rd story of a parking garage in Florida was causing issues with the owners of the property. The completed level had a uneven and poorly finished concrete surface. There desire was to have a new broom finish applied to the existing floor. 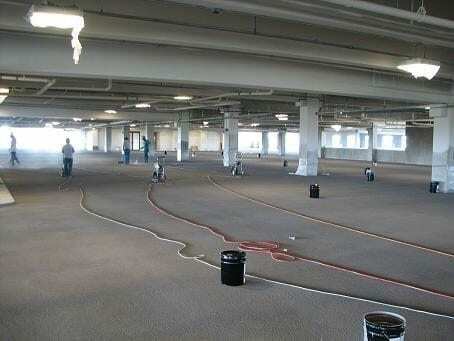 They called in the team from Baker Concrete to aid in the process of correcting the aesthetic look of this facility. Lets take a look at how they accomplished this feat. After 3 months of research the best process and products to use on this project, Baker Concrete choose SureCrete’s SureBroom as their concrete restoration solution. Some of the reasons behind their choice were: coverage rates, single component (just add water mix design), cure rate and track record on other job sites. This parking garage concrete restoration began with a crew of 8 members and average 6-8 working per day. 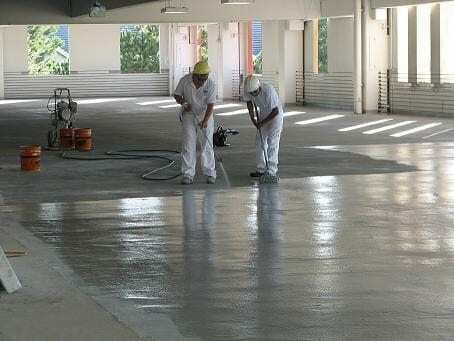 As the looked over the site the started by applying a scratch coat of SureBroom, via a stand up metal squeegee, to help in leveling out the floor. Once dry they began grinding off all high spots. The next step required them to clean the 3rd level floor with a product called SCR (Super Concrete Renovator). This Eco-Friendly concrete cleaner helped clean off any dirt, grease or other materials that would inhibit the proper bonding of the new surface coat, in addition the SCR aiding in profiling the concrete for extra adhesion. Now that the surface was level and clean they began the resurfacing stage. Here they used Graco RTX machines to spray out the SureBroom material, a product designed to give a new broom surface, at a rate of 35,000 sq ft of coverage per day. Once the base coat was down, they changed the spray tip on the machine to create a cement non-slip accent coat to the floor. This whole process did not take a trowel or the need to kneel down, total job time was 3 1/4 days to finish. 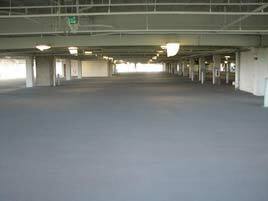 The last stage was to seal the floor, once again Baker Concrete went with SureCrete and used their Pigmented Sealer to protect the newly broom concrete surface. The applied 2 coats across the 98,000 sq ft via an airless sprayer, total time elapsed on this stage was 3 1/2 days. The end result was a job well done and a happy ownership of this Parking Garage.